Busy downtown streets that operate 2-way are often the most difficult streets for cities to reconfigure and retrofit. Many of these streets suffer from double parking and loading conflicts, have heavy turn volumes, and offer insufficient accommodations for bicyclists and pedestrians. 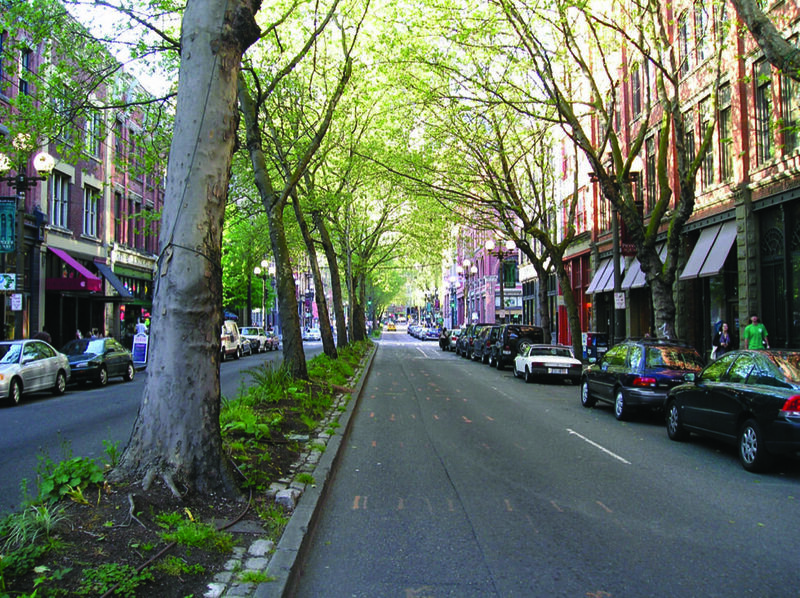 Retrofit constrained 2-way streets using lane diets and conventional bike lanes or add cycle tracks that decrease the overall width and offer a higher-quality bicycle facility. 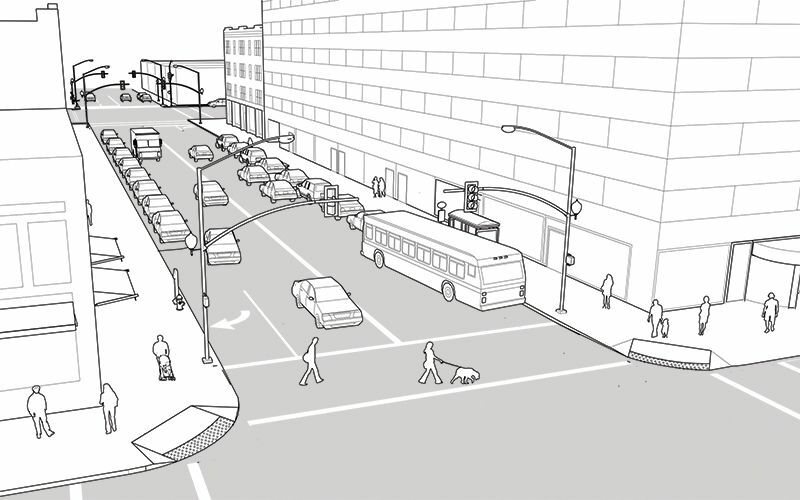 The street illustrated below depicts a 50-foot roadway within an 80-foot right-of-way. The above illustration depicts a constrained 2-way street in a central business district. While many downtown streets were converted to 1-way operations, many were not, resulting in streets that are heavily congested by buses, bikes, people, and cars. Especially in older cities, these streets may be a main route for multiple modes. Over the past several decades, many cities have successfully converted one-way streets back to their original two-way operation. 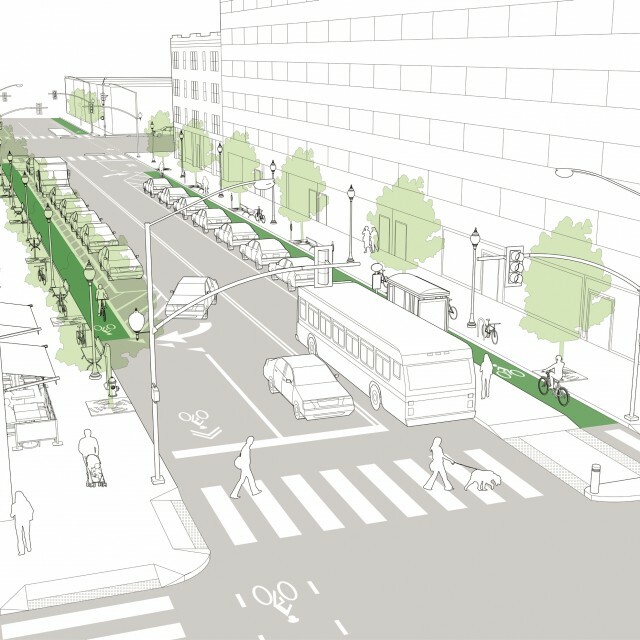 While one-way to two-way conversions have benefits, many one-way streets that are over capacity have opportunities to add protected bike lanes, dedicated transit routes and wider sidewalks that do not necessitate a full conversion. 1 On major bus routes, curbside bus stops may be undermined by double-parked vehicles and heavy rush-hour traffic. These obstructions hurt the reliability and on-time performance of transit vehicles. A lack of organization and striping can invite unintended uses and double-parking. Freight vehicles double-parking at peak hours create weaving conflicts and safety hazards for motorists and bicyclists. 2 Bus bulbs serve as dedicated waiting areas for transit users while decreasing pedestrian exposure during crossings. Far-side placement is preferable to near-side when possible. Apply turn restrictions for near-side bus bulbs where right-turning vehicles are likely to queue in the right lane. 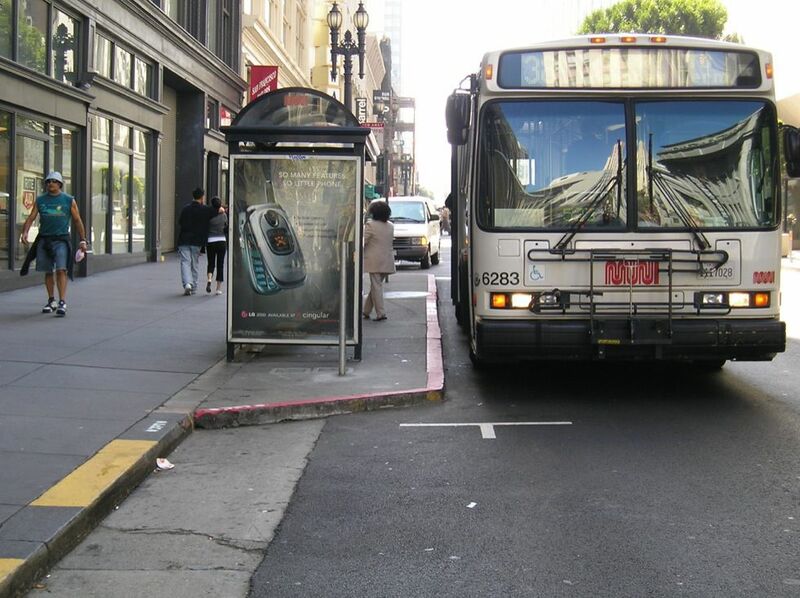 Bus bulbs may be created in the near term without affecting drainage if slightly offset from the curb or designed as a bus-boarding island with a bicycle cut-through. 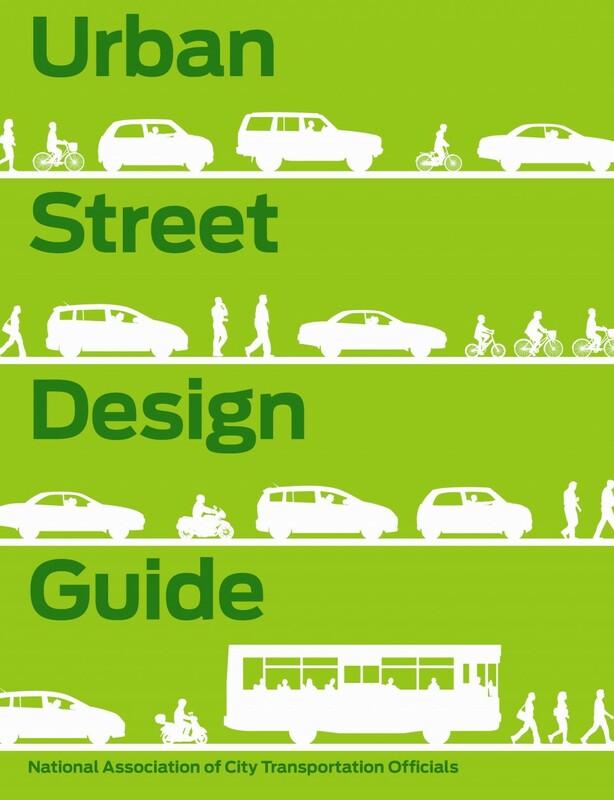 3 Create definition in the roadway using striping, cycle tracks, and narrow travel lanes. 4 Cycle tracks require special attention at intersection crossings. Conflicts should be highlighted using intersection crossing markings with the application of color optional. Bicycle signals may need to be applied for bicycle traffic to operate safely along the corridor, though bikes may use pedestrian signals in an interim design. Turning conflicts may be reduced through the implementation of turn restrictions. 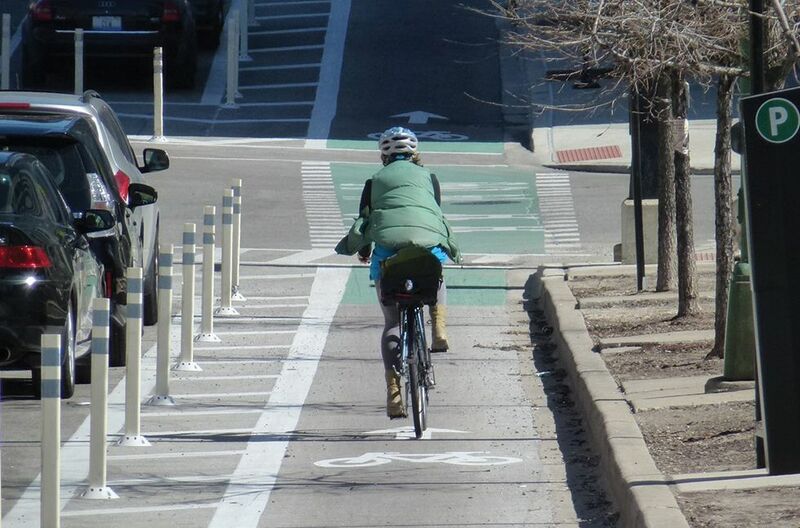 Kinzie Street in Chicago, constructed in 2011, protects bicyclists using parking, striping and flexible bollards. 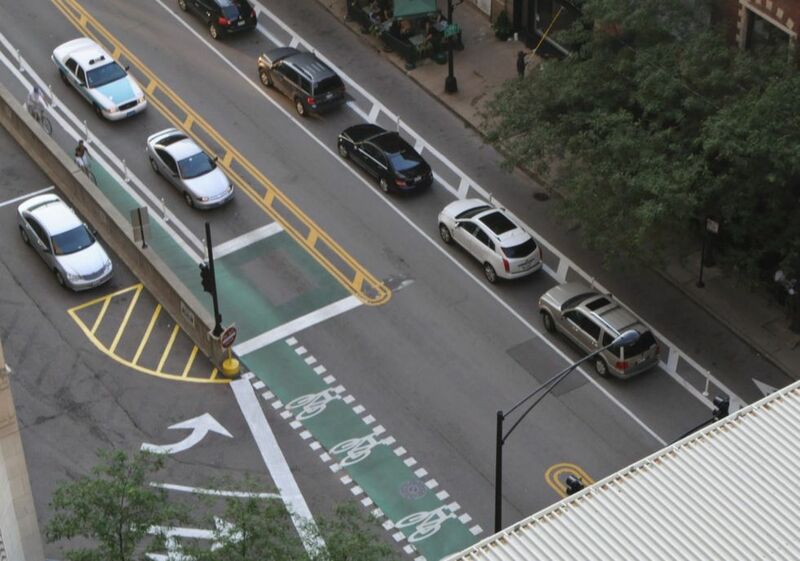 The cycle track, which is mirrored on both sides of the two-way streets, was the first in the city of Chicago. Baco, Meagan Elizabeth. “One-way to Two-way Street Conversions as a Preservation and Downtown Revitalization Tool: The Case Study of Upper King Street, Charleston, South Carolina.” Graduate School of the College of Carleston, Graduate School of Clemson University, 2009. Chiu, Yi-Chang, Xuesong Zhou, and Jessica Hernandez. "Evaluating Urban Downtown One-Way to Two-Way Street Conversion using Multiple Resolution Simulation and Assignment Approach." Journal of Urban Planning and Development (2007): 133(4), 222-232. City of San Francisco. “Loading and Delivery Management.” Better Market Street-Existing Conditions and Best Practices.” San Francisco: 2011. Entran, Plc. “Downtown Louisville: Two-Way Street Study.” Downtown Development Corporation, Entran Engineering Infrastructure Solutions, 2009. Gayah, Vikash V. "Two-Way Street Networks: More Efficient than Previously Thought?" Berkeley: Access Magazine, University of California Transportation Center, UC Berkeley, 2012. Hart, J. "Converting back to Two-Way Streets in Downtown Lubbock." ITE Journal (1998): 38-46. Pioneer Valley Planning Commission. “Effects of Two-Way Traffic Flow on High and Maple Street in the City of Holyoke.” West Springfield, MA: 2002. U.S. Department of Transportation. “Urban Freight Case Studies.” Federal Highway Administration Office of Freight Operations and Management. Washington D.C.: 2009.